Drs. Bob Johnstone and Manny Vallejo attended the ASA Board of Directors meeting in Chicago last weekend, Johnstone representing WV and Vallejo representing the Society of Obstetric Anesthesiologists and Perinatologists. Also attending was WVSSA member Dr. Ralph Harding. A report of board actions will appear in the ASA Newsletter in two months. Drs. 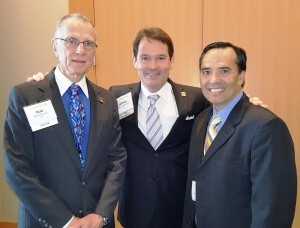 Bob Johnstone, Jeff Plagenhoef (ASA first Vice President) and Manny Vallejo. Both Drs. Plagenhoef and Vallejo will present talks at the upcoming WVSSA educational meeting. The ASA budget for next year will be $50.8million. Dues will remain the same as this year. Financial support for foundations will remain at the current level. Directors approved new statements on anesthesiologist distraction and fatigue and on anesthetic record documentation, which delegates will consider at the Annual Meeting in October. The intent is for anesthesiologists to develop policy positions that institutional leaders will adopt. Many officers and directors consider the new MACRA legislation the biggest driver of change in anesthesia practice today. MACRA stands for Medicare Access and CHIP Reauthorization Act. It solved the Sustainable Growth Rate problem, but directs Medicare payments into two programs: Merit-based Incentive Payments and Alternative Payment Models. Past ASA president, Alexander Hannenberg, MD will chair a task force exploring how anesthesiologists can best respond to the roll-out of MACRA. The ASA consultation program that has operated for about twenty years was suspended for modernization. The ASA will start a physician leadership education program. Greening of the ORs is an important movement, and ASA will establish a Task Force on Operating Room Environmental Sustainability. ASA membership is increasing, and member demographics are changing. More members belong to large groups, are on average younger and the percentage of women is increasing. 30 state societies now participate in combined billing with ASA – as West Virginia does. Rick Dutton, MD, Anesthesia Quality Institute director, is leaving for a position in a large group practice. ASA has retained consultants on the best ways to grow the AQI, which now has more than 40million cases in its database. A Charitable Networking Event that supports the Lifebox, Global Humitarian Outreach and Wounded Warrior Foundations is planned for Sunday evening at the ASA Annual Meeting. Titled “An International Tasting Reception”, it features cuisines and beverages from around the world. Donor levels to attend are $150 and $250. Three candidates for assistant Treasurer presented their platforms at the BOD meeting. Two will attend the WVSSA meeting – Drs. Jim West from Tennessee and Steve Hattamer from New Hampshire. ASAPAC. This Thursday, August 20, ASAPAC will host its Second Annual Day of Contributing “DoC” Challenge! All WV anesthesiologists who have not contributed to the PAC this year are asked to contribute on this day. Members can contribute on the ASA website at, http://asahq.org/advocacy/asapac. WV contributions are running behind last year, while the challenges remain formidable. WVSSA Annual Meeting is August 29 and 30 at the Greenbrier. Saturday features the educational session and Sunday the business session. The educational program is attached at the end of this newsletter – it is free for all WVSSA members. The business meeting will include reports from WVSSA officers, as well as action items on maintenance of certification and licensure of anesthesiologists assistants. Copyright WVSSA © 2019. All Rights Reserved. Designed by GADDIS Consulting Group.